Eastcoast Gold – Robyn Denny’s latest series of work on exhibition with Berman Contemporary – challenges the documentation of single narrative stories and reimagines the multifaceted history of the East African coast. It seems that ever since humans have inhabited the planet they have succumbed to their divisive nature and yearning to belong. As the earth’s population grew, nuclear families collated into communities which then became villages, cities and towns, eventually culminating in empires with dominant and absolute power. Derived from an innate sense to protect one’s longevity, it became common place to avoid and isolate that which was different – and hence forth began the act of ‘othering’. South Africa holds record for what is considered one of the worst systematic violations of human rights. The Apartheid, which followed the colonial invasion of the Cape of Good Hope – presently known as Cape Town – was a formalised extension of centuries of racial prejudice, oppression and an extreme example of discrimination of the ‘other’. Today the multiracial and multicultural nation grapples with the complex realities that have surfaced from a troubled and broken history. Still very much a divided country, the question of belonging and the ownership of history pervades the social fabric and collective consciousness. A topic that instigates fear, anger and further separation of its people. Robyn Denny, The Cinnamon Peeler’s Wife, 2018. Acrylic on canvas, 210 x 162cm. Courtesy of Berman Contemporary. As the Israeli-Palestine conflict over the Gaza strip wages on, Trump measures out the diameters for his border-wall and the debate on expropriation of land without compensation gains momentum in South Africa. War over territory is as ancient as the human population itself and these existential questions of identity and belonging are what drive this fragmented geography – “It is this belief in the sequential and generational which, mistakenly, has resulted in a world partitioned, cellular, isolationist and divided,” writes Jamal. It is this partitioning that Denny moves away from, it is her acknowledgement of the connectedness of geography and historical fragments that makes her work so potent. Robyn Denny, The King, 2018. Acrylic and gold powder on canvas, 120 x 162cm. All images courtesy of Berman Contemporary. “What interests me is relationship. I am painting myself into a relationship with my four protagonists,” says Denny. With her four protagonists – The Cinnamon Peeler’s wife, the Cape Malaysian woman, King Musa I of Mali and the golden sphinx – Denny spent a total of 1000 hours. In acquainting herself with the fragmented stories of her protagonists, she captures the rich complexity of a place and its people. In Cape Diab, Denny celebrates the conjoining of worlds at the Cape of Good Hope, the southern apex of the continent and a major global trade route. In the background are several framed images of ocean tides, colonial ships and outlined shores – this is the context in which the painting is based, an outline of the narrative. 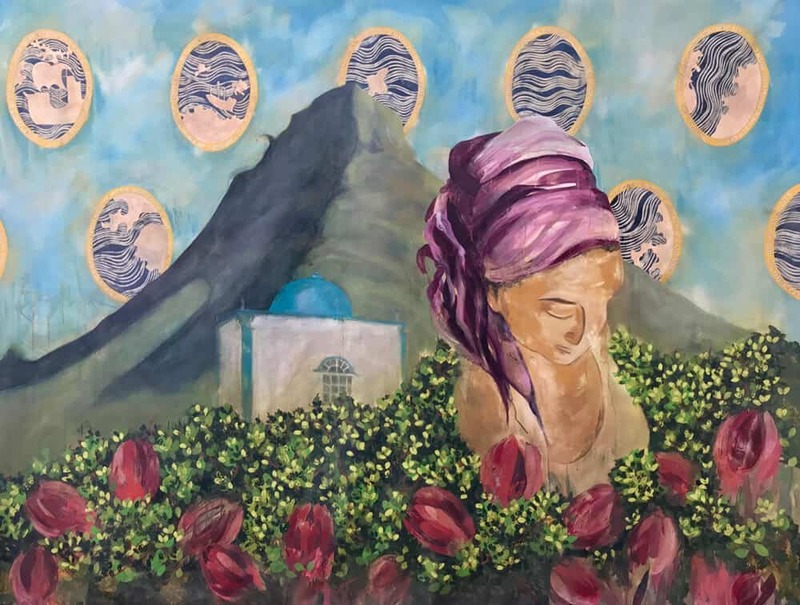 However, the protagonist, adorned with a bright purple head-wrap, is a creole woman depicted with her eyes lowered – a reminder of her strength and the oppression she endured. “I am curious about the deeply introspective Cape Malaysian and what she bore witness to,” says Denny. It is in this exploration of another’s history that Denny can better understand her own. 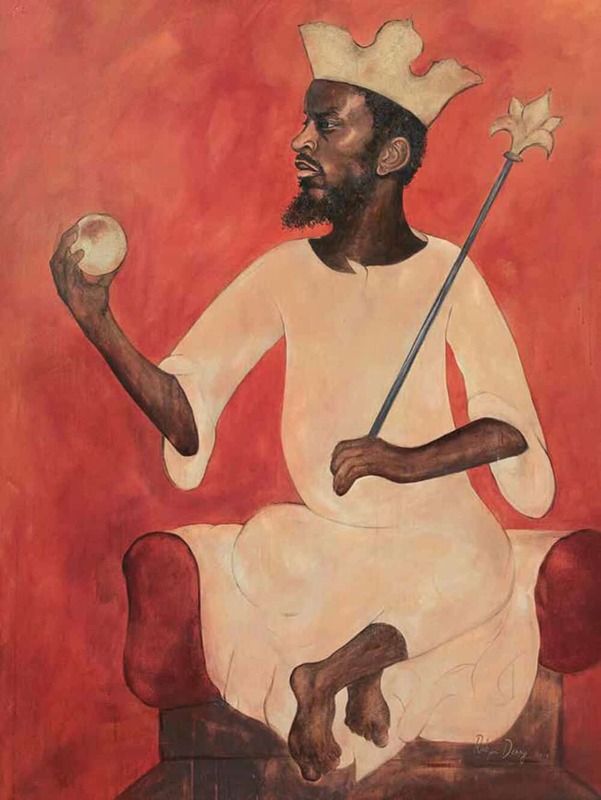 “I am asking the generous and visionary King (Musa I of Mali) about his library in Timbuktu, and how he single-handedly changed the price of gold on his pilgrimage towards the East coast and onwards to Mecca. I am inhaling the scent of The Cinnamon Peeler’s Wife and imagining the atrocities she saw in front of her,” says Denny. 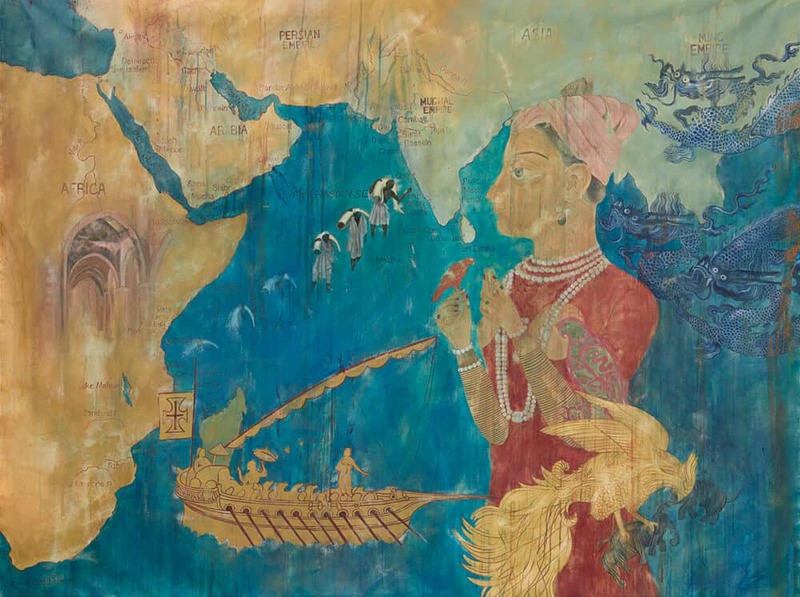 In the latter piece of work, she depicts a map of the Indian Ocean and its vast trade links, widely considered the “cradle of globalisation”. This piece makes reference to the exchange of material, memory and culture. It represents a shared history between continents – “It is this ‘flow’, this intersection of fictions and truths, which assume centre-stage in Denny’s monumental work,” writes Jamal. It is Denny’s reimagining of a refuted history that brings forth once again, “the others of ourselves”, and in so doing a connectedness of histories and understanding of human complexities. “The distinctiveness of Robyn Denny’s art lies in its understanding of this mix, or re-mix of times and places. If her work is centred on Africa, it is not however wholly informed by this particular continent. This is because Denny well understands the connectedness of geographies – and in particular the potent interconnectedness of land and sea,” writes Jamal. 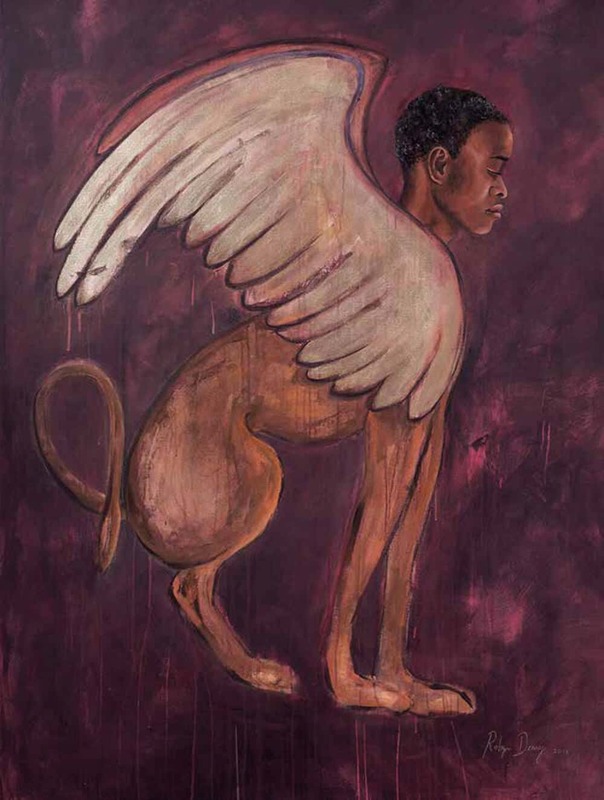 Robyn Denny, The Sphinx, 2018. Acrylic and gold powder on canvas, 120 x 162cm. All images courtesy of Berman Contemporary. A common theme in Denny’s paintings is the juxtaposition of beauty and violence, made reference to by fragments of colonialism alongside the poetry of human connectedness, diversity and strength. In The Cinnamon Peeler’s Wife, we see a faded structure, the remanence of an 8th century mosque in Africa, alongside an ascending graph of enslaved men carrying ivory – a reference to the interdependence of creation and destruction. “I’m interested in cruelty and compassion, or, put another way, in beauty and violence, which never seem far apart. I am grappling to understand what never seems to change in homo sapiens – our paradoxical ability to create and destroy,” says Denny. This venture into the human psyche further promotes the complexity of the human condition and the significance of fragmented memories of shared experiences in history. It’s in this reimagining of the smaller details, the combination of these fragments of history, culture and artefacts, that Denny discovers the “subtle threads of gold”. She turns to the ocean, a reflection of turbulence and change, a universal symbol for globalisation and says, “Until more of us learn to subdue this restlessness, our destructive tendencies towards others will overpower those of equality and compassion, making it near impossible to inhabit “the others of ourselves”. Robyn Denny & Mamela Nyamza in discussion in Denny’s studio. 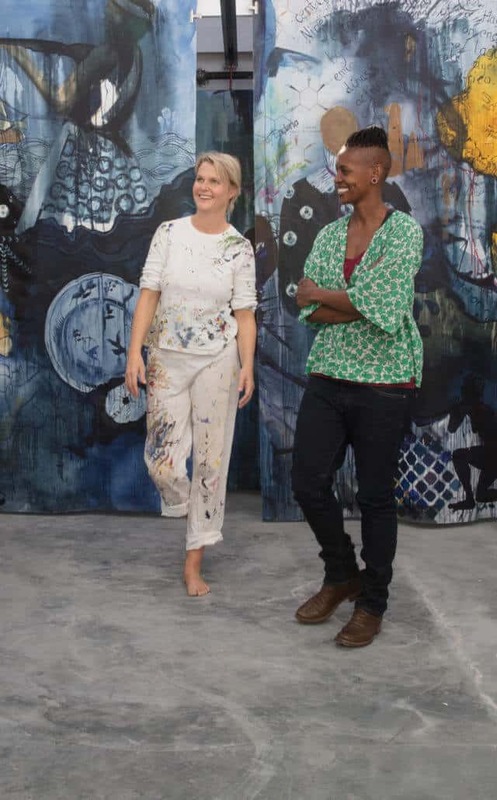 As part of their INDIGO – Passage to Healing collaboration which showed at AKAA Paris, Mamela Nyamza joined Robyn Denny on the opening night of her exhibition, ‘Eastcoast Gold’, to perform Battered Passage. Selected as National Artist of the Year by the National Arts Festival 2018, Nyamza responded viscerally to Denny’s paintings and consequent subject matter, choreographing a work of deep resonance and reaction. This featured as the pair’s fourth collaboration. Robyn Denny, Cape Diab, 2018. Acrylic on canvas, 210 x 162cm. Courtesy of Berman Contemporary. Amy Gibbings is a writer on ART AFRICA’s editorial team.